Looking for a primer to give you ideas as you remodel or build a new home? I found this book to be a good overview of what you should consider in the design process. Sandlin gives fundamental advice that you should consider to make your home visitable and usable throughout your lifetime. 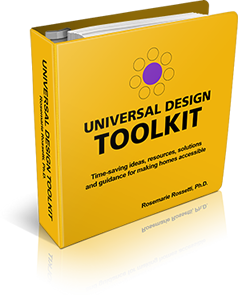 This book is packed full of universal design ideas! It is obvious that her expertise as a home designer gives her the insight as to how a home style influences the comfort and safety of the occupants. Sandlin also considers the home site, including the topography and orientation of the house to the sun. These considerations will be valuable as you are looking for a lot to build your new home. She also includes universal design ideas for the kitchen, bath and laundry room. There are sample floor plans included throughout the book, as well as photographs of tastefully designed homes with universal design features. As you study the photos, you will be able to visualize how your next home can be enhanced by the features that she illustrates. She chose the projects in this book to describe the philosophy she follows, but also included several images and diagrams of houses and spaces that are typical to the housing market that do not work. This book is a quick read. It includes several lists of universal design features that you should consider for your next home project. I contacted Sandlin to go beyond the book’s covers and asked what made her write this book. She said her motivation was based on a culmination of years of research and practice she had experienced. From the time she entered the University of Cincinnati, she had been on a mission to change the way we think about and build new houses. Her father was a custom home builder and even with his experience and skill, the homes he was building did not work if an occupant became injured, ill or old. She helped care for her aging grandmother who was forced out of her home of over 30 years because it was no longer safe or functional as her health declined. Sandlin was influenced by her experiences taking care of her grandmother, aunt and uncle. She vowed to change the way homes are designed and built. Sandlin studied residential design and architecture at the University of Cincinnati under the direction of universal design expert Dr. Wolfgang Preiser. 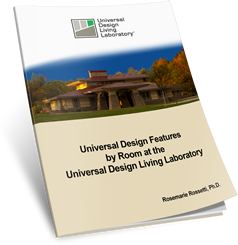 She began to incorporate the universal design philosophy into her home design practice. This 122-page, 8 ½” X 8 ½” full-color, paperback book was released in April of 2009 by Booksurge Publishing (ISBN-13: 978-1-4392-2210-2. ISBN-10: 1- 4392-2210-X.). A signed copy can be purchased from the author at www.lisasandlindesign.com or it can be ordered at www.Amazon.com for $27.75.